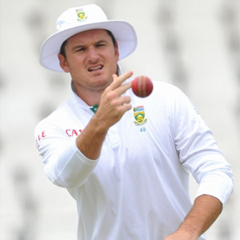 Cape Town - South African captain Graeme Smith said on Friday that his team would not rest on their laurels after securing an innings victory over New Zealand inside three days in the first Test at Newlands. He said South Africa wanted to build on an unbeaten run in Test matches in 2012 which took them to the No 1 ranking in the world. Asked if the manner of their innings and 27 runs win was an indication of a ruthless approach, Smith agreed. He said: "It's about winning. It's what you are defined on in modern sport. If you play games like this and you are dominant and can take the game forward it's very nice." South Africa were made to work harder than in the first innings, when they shot New Zealand out for 45 before lunch on the first day. With Dean Brownlie scoring 109, his maiden Test century, New Zealand defied South Africa's powerful attack for most of the morning before succumbing to the second new ball. They were eventually bowled out for 275 shortly before tea. Although there was no repeat of the first day rout, Smith had high praise for his bowlers. "We bowled superbly with the new ball in both innings. I thought we were excellent with the areas we hit and the intensity with which we started." Smith said he wanted the level of his team's play against largely inexperienced opponents to continue in the second Test, which starts in Port Elizabeth next Friday. "It's one bad performance away from being very close," he said. "I'm very realistic. I saw Queens Park Rangers beating Chelsea the other day. That's sport. You've got to keep yourself on your toes. "They've got good players. They are obviously struggling now to find who fits where and who can slot in to certain roles. They are a growing team but it's our job to keep them under pressure." New Zealand captain Brendon McCullum said he there were some positives from the way his team had fought back. "It is disappointing to lose a Test match in three days but we showed some resilience at times and managed to absorb some of the pressure that South Africa applied." He praised Brownlie, who arrived in South Africa as the team's back-up batsman and only got his chance because Peter Fulton was injured in a warm-up game. "Dean was brilliant," said McCullum. "It was a hard-fought innings that was fantastic for him and hopefully will be start of a very successful career. "To come out against the number one team in the world in the situation we were in and play a reasonably counter-attacking innings in trying circumstances was a fabulous effort." McCullum said the South African attack was the best in the world. "They keep coming hard at you and put you under pressure." He said the difference between the first and second innings was that the top order batsmen were able to defy them for longer. "They bowled exceptionally well again in that first spell with the new ball in the second innings. "Fortunately we were able to absorb that and get through it without too much damage. In the first innings they were able to bowl at our middle order with the new ball in helpful conditions. "We learnt some lessons and were able to use a better defensive strategy against them and that enabled us to put them under some pressure after tea yesterday." McCullum added: "We've seen some ways that we can be successful against them if we absorb that pressure and we've also seen that we can apply some pressure back on them if we do those hard yards up front. We have do that across the entire game, not just in the second innings." The game was effectively won and lost on the first day when man of the match Vernon Philander destroyed the New Zealand batting, taken five for seven. Smith said he was surprised that McCullum chose to bat after winning the toss. "I was a bit surprised but I have been caught 50-50 at toss time sometimes. The confident decision is to bat. "I didn't expect New Zealand to front up on day one. I was certainly 50-50 but we chatted around it and we were going to bowl," he said.